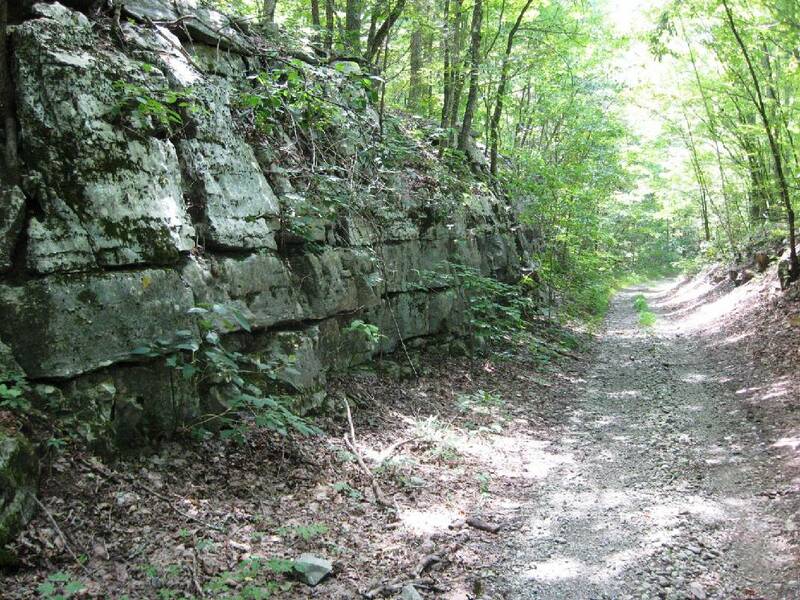 The roadbed of the former Mountain Goat Railroad which runs up Monteagle Mountain in Grundy County is the subject of a Rails-To-Trails project that will link towns and historic sites along the way. The Mountain Goat Rail path passes over the active main rail line that goes through Tunnel Hill between Cowan and Sherwood in Southern Tennessee. The railroad that passes through Tunnel Hill was built in the mid-1800s by the Nashville and Chattanooga Railroad that later became the Nashville, Chattanooga and St. Louis Railway, then The Louisville and Nashville Railroad, then “Family Lines” which later became the current CSX Transportation. At one point the railroad in Cowan employed more than 300 people. Track work and facilities were extensive compared to today, though traces of the old rail arrangement can be seen from the air. COWAN, Tenn. — A comparatively small parcel of private land at once connects a state natural area to a wildlife management area, takes in a years-long Rails-To-Trails project, and protects a part of the Cumberland Plateau that includes rare and endangered species of plants. Among The Land Trust for Tennessee's smaller acquisitions at 411 acres, the purchase of the parcel from a private landowner protects a site important to history, recreation, wildlife and rare plant species, according to Land Trust officials. The land links the 249-acre Hawkins Cove State Natural Area and the 15,000-acre Bear Hollow Wildlife Management Area, and protects a stretch of the abandoned Mountain Goat Railroad bed that is the subject of conversion to a public pedestrian and cycling path — the Mountain Goat Trail — planned to eventually link Cowan in Franklin County to Tracy City and points beyond in Grundy County. The property also contains the Cowan Tunnel, also known as the Cumberland Mountain Tunnel, constructed in 1853 before the trains that would use it were even able to get there, according to historical accounts at the Cowan Railroad Museum. The tunnel opened as the world's longest tunnel in 1854 and later was instrumental on both sides during the Civil War, lastly serving as Union Gen. William Tecumseh Sherman's supply line in the latter days of the war. Long freight trains still roll through the tunnel today on the line now operated by CSX. Modern trains continue a tradition of using "pusher" engines that help trains go up and through the tunnel from both ends. Alongside its historical importance, Land Trust officials said the property is "critical for connectivity and is home to numerous rare species of plants, including a large population of the Cumberland rosinweed, a state-endangered species only found in just a few counties in Tennessee and Alabama." The Tennessee Wildlife Resources Agency now owns the land through the purchase agreement between local native Peter Keeble and the Land Trust with a loan from Open Space Institute, a New York-based conservation group that administers grants for preserving habitat for rare and endangered species, water resources and recreational access to managed lands. Keeble said recently that he first started buying property along Sherwood Road at the southwestern edge of the Cumberland Plateau in 1985. His plan was to buy about 2,000 acres on the mountain, eventually ending up with about 1,100 acres in large chunks. The Tunnel Hill tract lies west of Keeble's other tracts. Keeble, a developer, business entrepreneur and musician, among other occupations, once had visions of building a resort-like operation on top of the small mountain that creates a backdrop for the small town of Cowan. Keeble's home is just more than 2 miles east of Tunnel Hill with a view across it of Cowan. "I've always liked that little mountain," Keeble said. "A route of the Trail of Tears might have gone over it, the Civil War history on it is just nuts because it was such a strategic place, and with the Mountain Goat Trail I realized that there's an opportunity here to consolidate a lot of recreational activity." While the business ideas for the hilltop never came to fruition, Keeble is happy to be able to preserve something for future generations. "I was glad to entrust it and that it will remain undeveloped," he said. "It gives access to the tunnel and certain vistas that you wouldn't get otherwise." In addition to state and federal funding through the TWRA, the project was supported by grants from the Open Space Institute because of the tract's importance in facilitating wildlife adaptation to climate change, officials said. Open Space assembled the funding from the Doris Duke Charitable Foundation, the Lyndhurst Foundation, the Benwood Foundation and the Merck Family Fund.